Whether you're an entrepreneur looking to learn from successful crowdfunding campaigns or you're a backer/investor on the prowl to find trending crowdfunding campaigns, there are tools out there for your search. 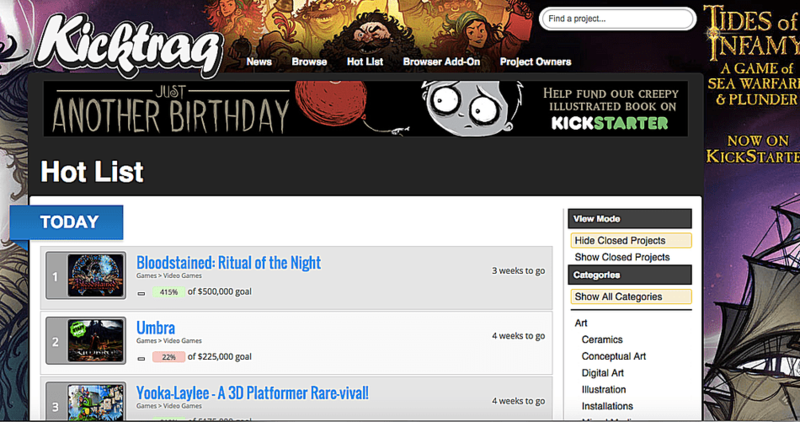 Instead of browsing Kickstarter looking for hot crowdfunding campaigns, Kicktraq does that for you. It scours the leading crowdfunding site to find breakout crowdfunding campaigns. Kicktraq provides a lot of data for its users—you can see how quickly crowdfunding campaigns have raised their money and how much they are forecasted to raise given their momentum. Wikipedia's page of highest funded crowdfunding campaigns is a surprisingly good resource. It's kept relatively fresh with ​an up-to-date content of the crowdfunding campaigns that have raised the most amounts of money. You can see the name of the crowdfunding campaign, what crowdfunding platform it raised its money on, and some notes and resources about the individual campaign if you want to dig deeper. The largest crowdfunding platform on the planet has a very convenient filter on its crowdfunding campaigns. You can filter crowdfunding campaigns on Kickstarter for a variety of things (like ​Magic, Popular, and Newest) including Most Funded. There is always a deluge of projects crowdfunding simultaneously and this page can easily help in filtering the most highly funded campaigns. Projects on Kickstarter are all-or-nothing which means that unless they reach their funding goals, the crowdfunding campaign doesn't tip. Indiegogo is the pioneer in reward-based crowdfunding sector and has its own great page of top-funded crowdfunding campaigns. They're broken down by sectors, so if you're interested in top funded technology campaigns or music or film, the site has you covered. Indiegogo offers entrepreneurs two options for their financing: all or nothing (unless the campaign reaches its goals, it doesn't tip) or flexible (the campaign tips regardless if the goal is met). If Kickstarter and Indiegogo are the market leaders in crowdfunding in the US, Ulule is leading the crowdfunding pack in Europe. Ulule runs numerous crowdfunding campaigns simultaneously and gives its users the ability to sort them by top funded campaigns. If you want to see something cooler, Ulule also has a page where you can access live stats—get a feel for how many projects have been run, how much money in total has been raised on the site. Things like that.